Gretchen Brumwell is principal harpist of Orchestra Iowa and an active performer throughout eastern Iowa. In addition to her work as an orchestral and freelance musician, she has appeared as a featured soloist with many area symphonies, including Orchestra Iowa, the Waterloo/Cedar Falls Symphony, the Ottumwa Symphony, the Oskaloosa Symphony, and the Iowa City Community String Orchestra. As a chamber musician, she is a regular performer on Orchestra Iowa’s Showcase Chamber series. 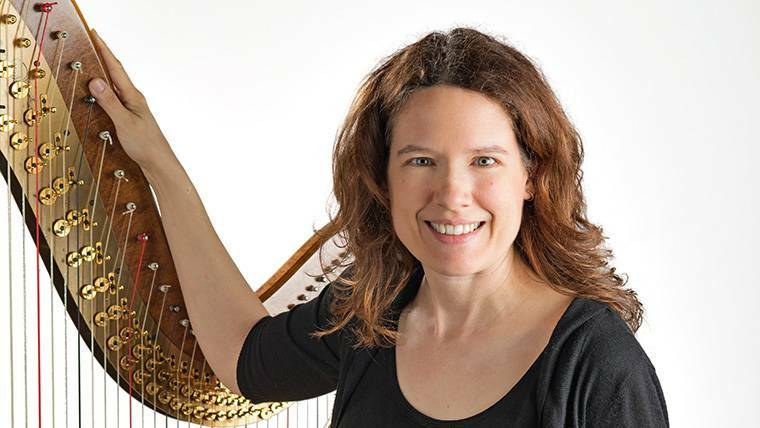 A passionate educator, Ms. Brumwell serves as harp instructor at the University of Northern Iowa, Coe College, Wartburg College, and the Orchestra Iowa School, where she also directs the Advanced Harp Ensemble. In the summer she is the harp instructor at the Five Seasons Chamber Music Festival and the Lutheran Summer Music Academy and Festival. Ms. Brumwell holds a master’s degree in harp performance from Rice University and a bachelor’s degree in biblical studies and humanities from Grace University. While at Rice University, she was a regular substitute with the Houston Symphony and the Houston Ballet Orchestra. Being the featured soloist for Ginastera’s Harp Concerto. In the public schools where I grew up (Council Bluffs, IA), harp lessons were offered as a music class. In other words, you could register for choir, band, orchestra, or harp. In seventh grade, harp worked out best in my schedule, and I simply never stopped! My harp teacher in college (Mary Bircher) both transformed my technique and made a harp career seem possible. My teacher at the Salzedo Summer Harp Colony (Alice Chalifoux) modeled unrelentingly high standards mixed with personal warmth and the selfless giving nature of a truly great teacher. My teacher at Rice (Paula Page), guided me in making my career a reality. An author and teacher of either English or history.